More than one billion people lack access to clean drinking water, sufficient food and electricity. Meanwhile, the global population is growing by some 80 million people every year. By 2030, the nine billion people living on earth will need 30% more water, 40% more energy and 50% more food to survive. 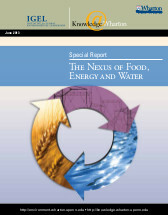 Given the complex relationships among all three resources — the nexus of food, energy and water — meeting these demands will require thinking in terms of systems, not silos. It will take collaborative approaches that embrace rather than battle natural processes. And it will mean new technologies and approaches to everything from bio-fuels to desalination. This special report, produced in coordination with Wharton’s Initiative for Global Environmental Leadership (IGEL), takes a close look at the key issues. It’s increasingly hard to argue for business as usual when the stakes are so high, and yet the corporate response to issues around resource scarcity and the environment is not nearly equal to the size of the problem. Still, companies are beginning to move beyond public relations benefits to give sustainability a seat at the table. They are realizing that the inter-related problems of food, energy and water threaten their own sustainability, and that there is a business opportunity in increasing efficiency and reducing waste. Once we exhaust the world’s supply of fresh water, there isn’t any more. Or is there? The amount of fresh water available globally has not changed for eons, so conservation has gained some traction as some of the wealthiest and driest nations moved to desalination, while most cannot afford the huge energy costs that come with it. But breakthroughs have dramatically cut desalination’s energy consumption, and now the industry is taking the next step by looking to switch from fossil fuels to renewables. Private enterprise is helping to hasten the day when the oceans may become virtually unlimited sources of fresh water. Ethanol production uses about 40% of the U.S. corn crop, and has been blamed for sharply rising food prices — even as the federal government ramps up both quotas and use of the fuel in gasoline. But cellulosic ethanol, produced from the inedible parts of plants and not yet commercially available in the U.S., offers a sustainable alternative. Brazil’s efficient sugarcane fuel production provides a model.